For this post I thought I'd talk about a plug-in I developed for Apache JMeter. It's called Aggregate Report To Database. 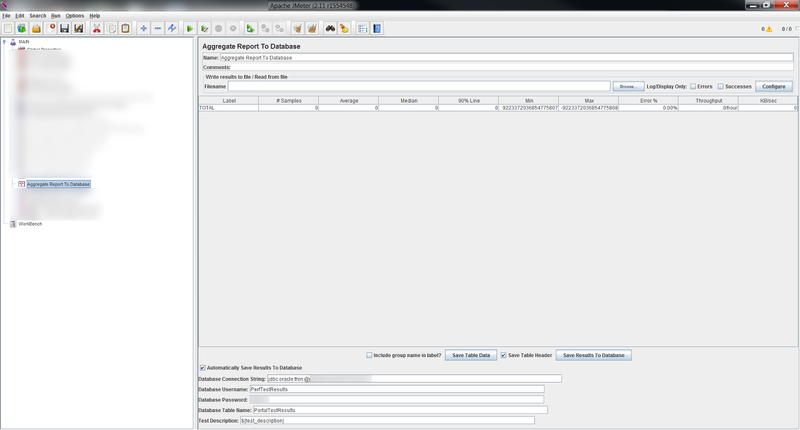 If you're familiar with Apache JMeter, you're no doubt familiar with the Aggregate Report plug-in. My Aggregate Report To Database plug-in builds upon the functionality of the Aggregate Report to enable both automatic and manually triggered saving of results to a Database (currently only Oracle, but would be very easy to enable others). The main reason I developed this plug-in was in order to make it simple for development teams to take the performance testing scripts I'd made for their products and re-purpose them for nightly performance frameworks. Now teams can leverage existing scripts and have them run against their nightly builds to have traceability of performance improvements and regressions to builds, to quantify performance improvements and regressions, and to analyse performance trends over time. The build system triggers a JMeter test to run, the results of which are automatically saved into a relational database at the end of the test (so that saving the results has no impact on the test itself). We use Atlassian Confluence as an internal wiki. A page is configured by teams in the wiki to automatically graph the results (by querying the results database) of the past 2 weeks of performance testing against nightly builds for all the different features in a product. This makes it easy for a team to see at a glance how performance of different functionality has trended over time by simply loading a page. It's also an interesting set of graphs to show at a sprint demo. Where can I get this plug-in? I haven't currently published this plug-in publicly, but this is something I am definitely interested in doing if there is significant interest in getting it. I'd just have to clean a few things up and get permission from my employer to make it open source.